When the weather gets hot, hot, hot, it is time to enjoy grilling outside by the pool with family and friends. But maybe your grill needs a little bit of work before you can start cooking up burgers and ribs. And if you have a gas grill, you need to be careful. Do you know how to refurbish a gas grill? Here are a few simple safety steps. 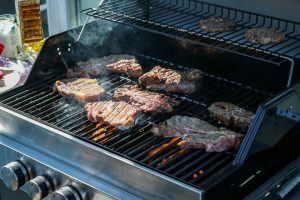 Much of the grime and wear and tear of grills comes from burnt food, ash, grease, and soot that has been left to crust on too long. Repaint the exterior of your grill. Once a year you should don some rubber gloves, pull out your shop vac, and clean out the grill. Learning how to refurbish a gas grill is simple. Vacuum any loose grime and particles. Remove the burners and vacuum again. Then pick up a wire brush and carefully scrape the gunk. Be sure to inspect the burners to see if they are still good. Light them carefully. Look for burners that light up quickly. They should burn evenly. If there are any issues, replace them. If they look okay, then scrape and clean them carefully before using again. Always have a lower rack and upper rack to keep separated between the flames and your food. This helps distribute the heat more evenly. The lower rack can hold briquettes or lava rocks. You can clean briquettes easily by soaking it in vinegar. Scrub carefully with a wire brush. Remember to replace anything that cannot be cleaned, that includes the grate. Iron grates need to be re-oiled after each use. Stainless steel and porcelain coated steel bars are two other popular options. Replace the drip guard if necessary. Even higher-end gas grills may have issues with their igniters. Replace used igniters. They generally have a short lifespan, meaning that you might need a box of matches nearby every time you grill. Be sure to replace the ignition system if it is not working properly. No matter how old and grimy your gas grill looks, it is possible to refurbish it safely, quickly, and affordable. If you are not sure that you want to undertake cleaning the grill, then simply contact a professional. They can offer expert advice and service to help you start a summer of grilling fun!